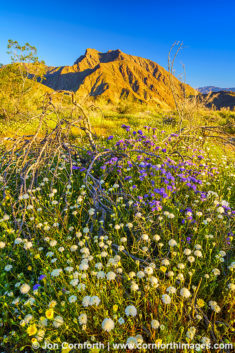 View Anza Borrego Desert State Park photos, license Anza Borrego Desert State Park stock pictures, and buy stunning Anza Borrego Desert State Park prints by award winning professional photographer Jon Cornforth. To license an image for editorial or commercial use, click on the License Image button and fill out the form. 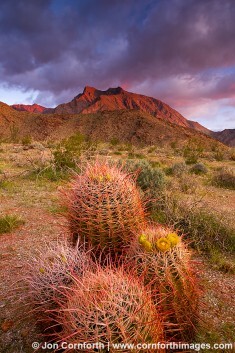 To purchase a fine art print, select your image size and presentation style before clicking on the Buy Print button. 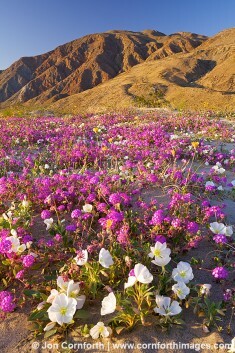 Anza-Borrego Desert State Park is a state park located within the Colorado Desert of Southern California. 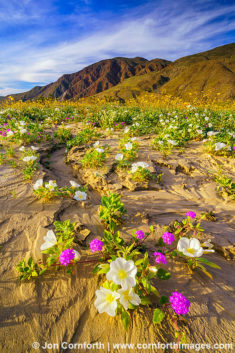 The park takes its name from 18th century Spanish explorer Juan Bautista de Anza, as well as from “borrego,” or the Spanish word for bighorn sheep. Boasting 600,000 acres, this is the largest state park in California. After New York’s Adirondack Park, it’s second largest in the contiguous United States. It occupies eastern San Diego County as well as several surrounding counties. The park’s eroded badlands provide an eerie view into a long-vanished tropical past. The inland of southeastern California was not always a desert. Rather, it was once a lush, tropical forest. For this reason, the part contains fossils of preserved plants, a variety of invertebrate shells, animal tracks, and an array of bones and teeth. Most fossils here date from six million a half million years ago. For perspective, that’s about 60 million years after the last dinosaurs.